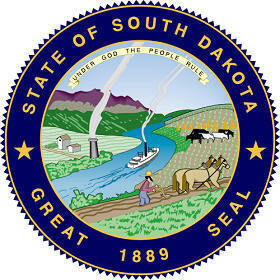 "Under God the people rule"
The South Dakota state seal identifies government buildings and officials and is a centerpiece for the South Dakota state flag. 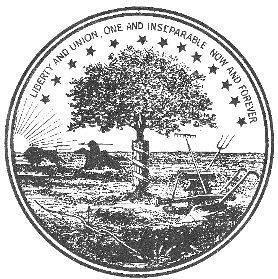 The symbolism, history and emblems of the seal are described in this article with fast facts and information. Fact 2: Fact 2: Territorial Governor William Jayne approved the design on January 3, 1863. A steamboat, an extremely important mode of transport in the early history of South Dakota ascends the river. The invention of steam power made it much easier to travel along the rivers, replacing the flat boats. Steamboats had a steam engine which turned a paddle wheel at the back of the boat. 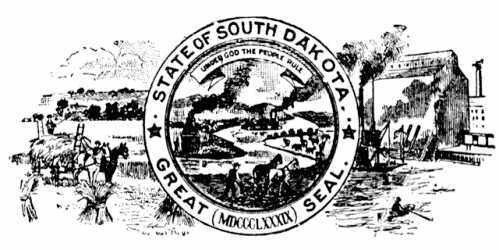 The South Dakota seal is kept and used as required by the Constitution and laws of the state. Official Nickname "Mount Rushmore State"